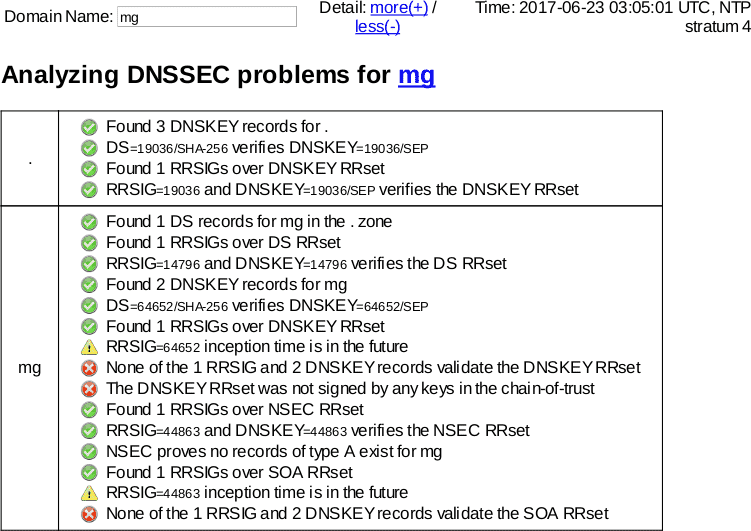 This page gives some details on the .mg (Madagascar) TLD DNSSEC outage on June 23, 2017.
zonemaster.net archived "Delegation from parent to child is not properly signed (signature: DNSSEC signature not incepted yet)." OpenDNS does not support DNSSEC, and instead supports DNSCurve. Google Public DNS currently supports only DNSSEC, and thus, Google's users saw SERVFAIL for queries under mg during this outage. ; <<>> DiG 9.4.2-P2 <<>> mg. @resolver1.opendns.com.